The main contact for the choir is Sileas Sinclair, our Conductor. Please contact her on 07881 656245. The choir is administered by a committee of 10 elected from its membership. Current Office-bearers are as detailed below. 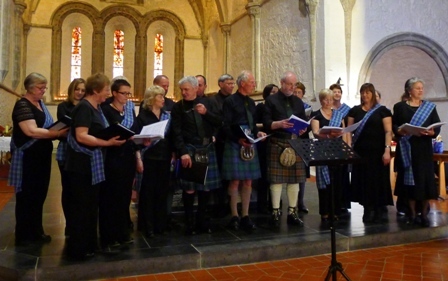 Oban Gaelic Choir currently numbers around 40 singers, and we always welcome new members. It is expected that each member will allow a few hours a week for practising new songs so that we can consolidate and move on during choir nights. Obviously, it may not be possible to attend every week but regular attendance is desirable to ensure progress is made. If anyone is interested in joining us just come along on a Monday night. Should you require further information, please contact our conductor or secretary at the numbers given above. We look forward to welcoming you to Oban Gaelic Choir.